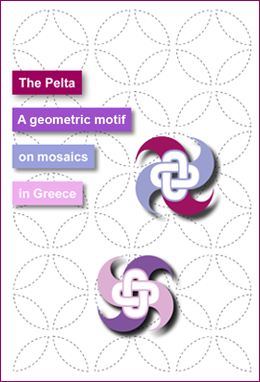 The research on the pelta motif on mosaics in Greece is taken from my 1994 dissertation*. In my work I was supported by the mathematician and Germanist Heinrich Siemens and the linguist Yannis Kakridis. As a classical archaeologist I’ve concerned myself as closely as possible with pelta decoration, as well as the associated geometrical patterns, by collecting, categorising, describing and comparing as many examples as possible. In the case of some descriptions I’ve gone into close detail (perhaps even too much detail), in order to capture every distinctive feature. Now, more than 20 years later, I would probably approach the pelta patterns differently and concentrate more on the mosaic artists’ reliance on the mathematical knowledge of the time. In recent years there have been many developments in this area (see the Wikipedia-Artikel on wallpaper group, plane symmetry group or plane crystallographic group; pattern in islamic art, islamic geometric design) and there is analysis by mathematicians which could also be interesting for archaeologists (e.g. Tiling – Wolfram Demonstrations Project; research into circle parts). If time allows, I’ll deal with this theme in a later study. This work would include a consideration of the psychological effects of geometric designs, layouts and rhythms in motif sequences. This article is also available in German. *Alexandra Kankeleit, Kaiserzeitliche Mosaiken in Griechenland (Dissertation Bonn, 1994) Vol. I pages 197-228. A precise bibliography for the mosaics dealt with here can be found in Catalogue Vol. II.